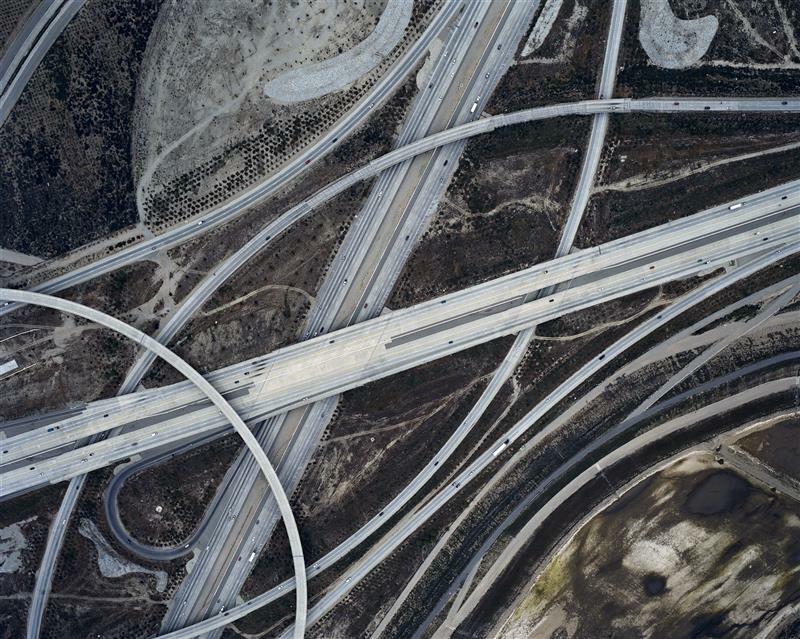 Christoph Gielen’s new photo book “Ciphers”. Worth a thousand words, at least. Book review by Raphael Shammaa. It’s 2003; a building is scheduled for implosion by a demolition company. Perched atop a nearby public housing tower, Christoph Gielen is poised to record the event – his first ever aerial shot… ahem… his first ever “almost” aerial shot. The charge is exploded, the building comes down; Gielen gets what he came for. He is hooked. Gielen is hooked on shooting from higher elevations, yet rooftops are just a beginning and Gielen aims to join the likes of Michael Light, David Meisel and Ed Burtynsky as a true aerial photographer. His real aerial debuts feature him scrambling his way out of helicopters in mid-air and onto the skids of small, inexpensive, noisy, vibration-prone training crafts to capture his subject like a real, honest-to-goodness aerial photographer. As an environmental activist Gielen’s early focus and concern is car-centric growth and sprawl, and by 2004 he decides to narrow his attention on the emblematic misuse of land and resources as personified by the American suburb. He decides to dedicate his aerial probing efforts to prompting a general reconsideration of unchecked growth in the area of the built environment. Gielen’s aerial images of what he refers to as “formations” – an evocative term, document the seemingly endless replication of these built environments whose cookie cutter layouts and repetitive architecture are symptomatic of unchecked growth. Aware that malignant growth often assumes esthetic-looking forms, Gielen decides to exploit these forms to draw us in. He does due diligence and engages into lengthy research; he then gets into his car to investigate and verify facts on the ground – driving many long miles, eventually zeroing in on the perfect specimen to document and provide as evidence. He waits for the right time and the right light and takes to the air with his camera. Gielen knows a picture is worth a thousand words. And a lot of what makes his images so eloquent is the repetitive nature of his compositions and of the color palette – suggestive of the industrial scale and pervasiveness of sprawl accross the global landscape. Although some images recall the grayish aerial views from the WWII era, the aerial arrangements of many other images cause these sprawl formations to mimic the appearance of sumptuous gem-studded brooches and heirloom necklaces in their seductive velvet cases. 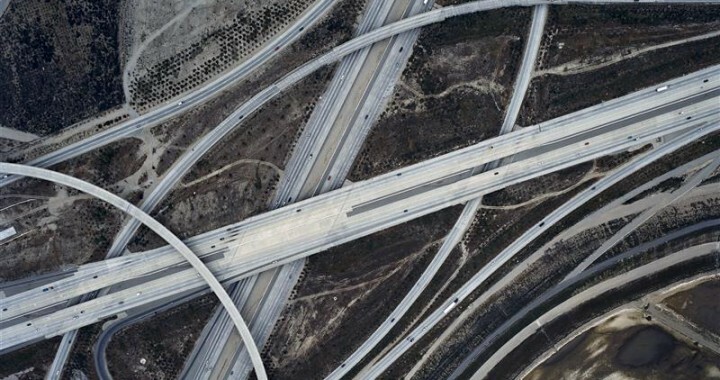 Gielen is a German-born artist and photographer who specializes in aerial studies and video. Excerpts of Gielenʼs work and feature articles about him have appeared in numerous publications such as The New York Times, CNN World, Metropolis Magazine, Laphamʼs Quarterly, and the Journal of The American Planning Association. He is the author of Ciphers (Berlin: Jovis Verlag, 2013). He has also been a speaker at discussion forums such as the BMW Guggenheim Lab, The Congress for the New Urbanism, and TEDxMidAtlantic, and featured on programs such as “World One” CNN TV, and “Open Journal” KPFT-FM radio Houston. Gielen is a recipient of grants from the Fund for Investigative Journalism, the Aaron Siskind Foundation, Furthermore: a program of the J.M.Kaplan Fund, and the Puffin Foundation. His pictures were also nominated for the REAL Photography Award by the Dutch ING Bank Initiative, and the Center Santa Fe Prize for Photography. Posted in Reviews and tagged Aerial Photography, Architecture, Book Review, Christoph Gielen.